The Swan, The Weavers and The Waterbed. The wisdom behind hoisting a heavily pregnant woman up onto a narrow, high table that’s been fitted with a slippery water-filled mattress seemed questionable to me at first; I must have looked like a very pink, slightly anxious whale trapped in low tide as I clambered aboard. 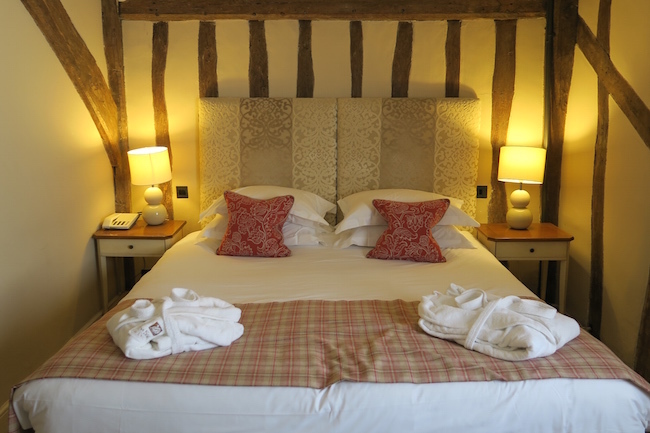 But then, at around three minutes into my New Beginnings massage at the Weavers’ House Spa in Lavenham, I had something of a body treatment epiphany: waterbeds are an absolute Godsend for aching, third trimester joints. 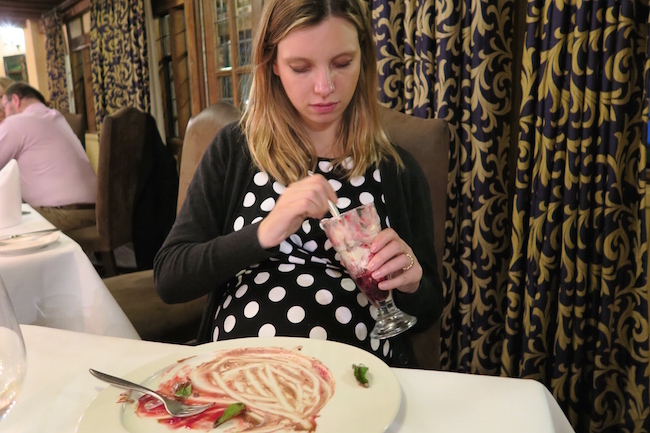 Or any joints for that matter – let’s not be selfish and just earmark this one for the pregnant – Mr AMR had his massage on the waterbed (more of him later) and declared it the best he had ever had. But I’m getting ahead of myself, starting mid-treatment, with the wonderful Abbie negotiating her away around my gargantuan, 36-week torso, managing to slide her hands under and around my aching hips and massage hands and fingers whilst my forearms hung like dead weights from the side of the bed. She was just marvellous, working on my shoulders and neck at almost “sports massage” intensity whilst being reassuringly delicate around the lower back and tops of the legs. Absolutely top-notch. But there I go again; straight in with the kneading when really I wanted to start with the spa itself. 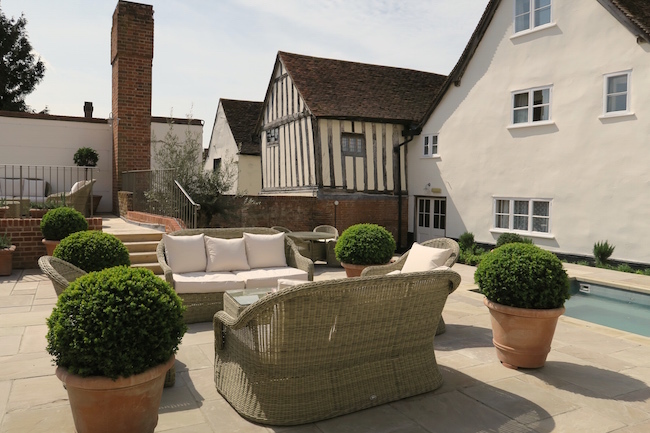 Weavers’ House Spa is in a little place in Suffolk called Lavenham. 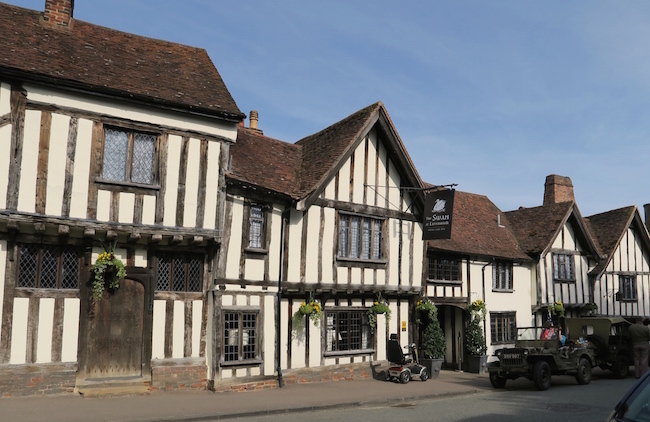 If one of your pastimes is pretending you’re in the tudor times then you will love Lavenham – squint your eyes to make the cars and telegraph poles disappear and you’re there, surrounded by crooked half-timbers and quaint little squished-in houses. If you’re one of the many who don’t enjoy pretending to be in the tudor times (I’ll admit it’s a niche fetish) then you’ll no doubt equally enjoy Lavenham, with its striking church and chocolate-box streets and the miles and miles of unspoilt English countryside that surrounds it. It’s the kind of place you’d go and take loads of photos and (so long as you got good weather, which we did) say to each other “oh what a lovely day out!” There’s nothing to actually do there, really, apart from eat and drink and walk and read the papers, but it’s as good a setting as any in which to do these things. Oh – and sit in the spa. I’ll get there in the end, with this spa thing. Weavers’ House Spa sits back from the little high street and is attached to the very characterful Swan Hotel (creaking boards, corridors with floors that tilt to one side then the other, doorways that you almost have to bend over double to pass through, excellent food). If the Swan Hotel represents everything ancient then the Weavers’ Spa, with its huge glass windows and neutral, tasteful decor has both feet firmly in the modern world. My first impressions were so good I Googled the spa before I had left the little changing room – so many “spas attached to hotels” are terrible, greedy afterthoughts offering athlete’s foot steam rooms that smell of pine disinfectant and facials carried out by people who have learnt their trade in the most dubious of places. Not this one. Chic, professional and the kind of place you really would spend a whole morning in, reading magazines and sipping herbal tea. I was tempted (and this rarely happens) to book in another treatment (anything! everything!) but Mr AMR was already booked in for his treatment and someone had to look after Dexter the Dog. I was also tempted (and again, this rarely happens, mainly because I always have so many beauty products lined up to be tested) to try out each and every one of the gorgeous Temple Spa products that were dotted around the place. Sumptuous-looking balms and oils, refreshing gels, calming mists… I actually have a selection here and will test and report back when I get a moment – the cleansing balm is, I think, exemplary, and you’ll be hearing about that particular gem sooner rather than later. So there you go. That’s a ten out of ten for Mr AMR, so you can only imagine what our conversations are like when something’s not so great. Ha! On the “smelly oils” issue; I really liked the fact that the oil Abbie used during the pregnancy massage wasn’t an overly-scented aromatherapy oil. In fact she used a potent facial treatment (It’s All Good) which felt incredibly decadent and special – when can you ever justify using a face product all over your body? – but I liked the fact that the emphasis was all on touch and not on smell. Don’t get me wrong, I love a good aromatherapy blend, but during pregnancy if there’s one fragrance note that’s even just a little bit not to your liking, it can be ruinous to your enjoyment. 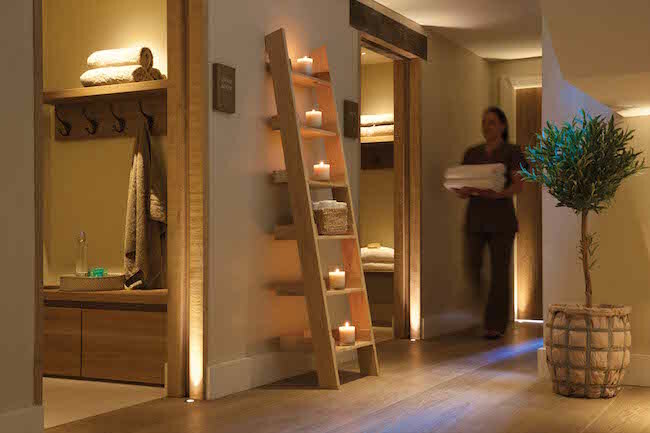 I liked that Temple Spa had thought this through when they devised the New Beginnings treatment and I also liked that Abbie was completely open to adapting any part of the treatment to make it more suitable and tailor-made to my requirements. I very definitely needed to be on my side for the duration (try lying on your back with a ten tonne weight on your internal organs!) and so various cushions and bits and bobs were moulded into a kind of body-hugging fortress which supported the bump and also stopped me from rolling off onto the floor. Bonus. 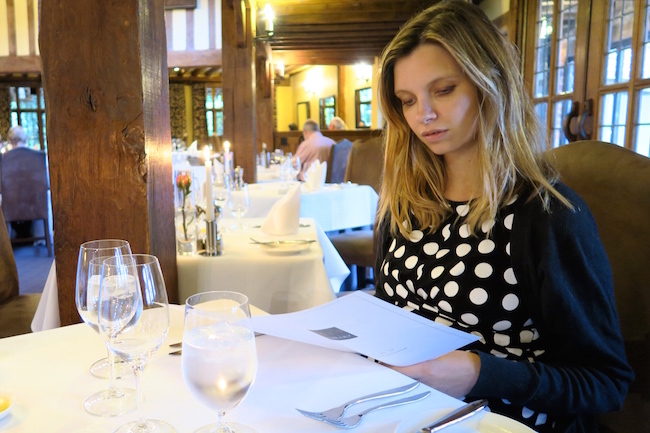 Thanks Mr AMR for that particular piece of photographic espionage. It’ll be these pregnancy moments I’ll treasure forever. Our room at The Swan was as charming and crooked as I had hoped it would be and I fell into the deepest sleep almost as soon as I hit the pillows, stuffed with scallops and Eton Mess and melting chocolate-and-cherry pudding and with the dog curled up on my feet (about as comfy as it sounds). A very satisfactory end to a truly relaxing day. 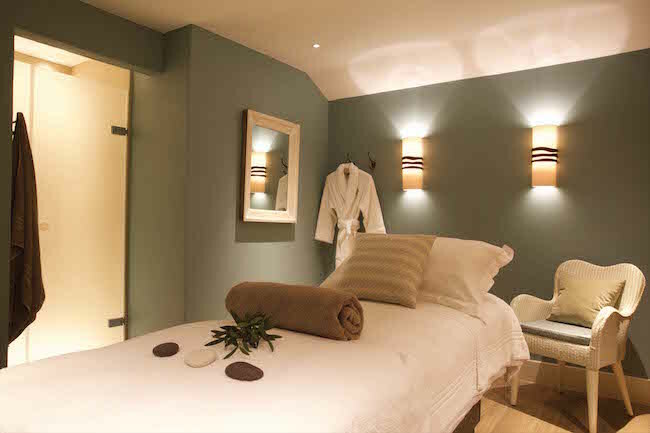 *My stay at The Swan and treatment at Weavers’ House were complimentary as a guest of Temple Spa.